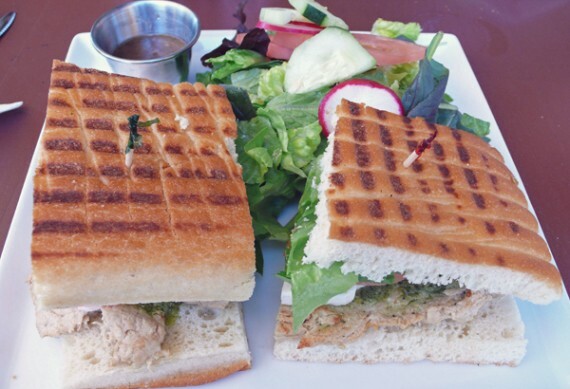 new vegan menu at fratelli cafe! if you read the LA vegan sites, you’ve probably heard of jennshaggy’s recipe blog. 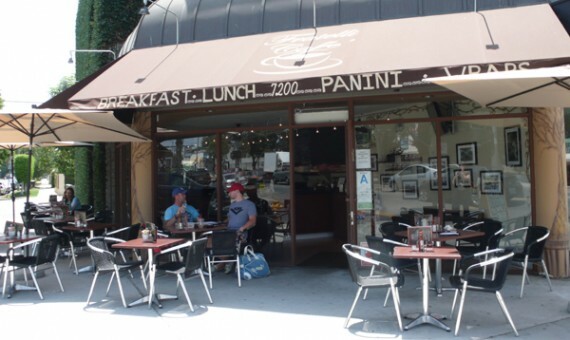 well recently, jenn has been doing more than blogging; she’s lent a hand to fratelli cafe on melrose and has helped them design an extensive vegan menu. 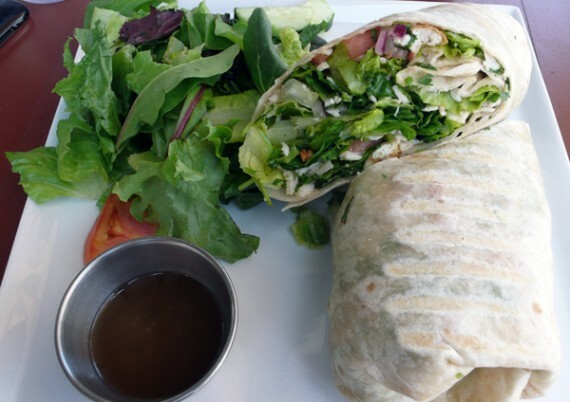 now the small eatery has a variety of vegan sandwiches, wraps, and salads stuffed with high-quality meat substitutes, fresh vegetables and marinated tofu. 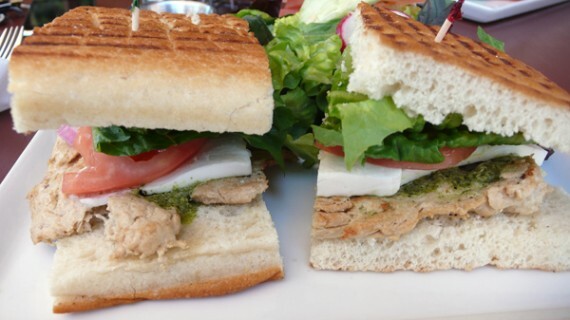 i have dined at fratelli cafe twice, and both times the food was delicious. on my first visit to fratelli, they had just run out of their meat substitutes, so the only protein option they had was marinated tofu. my friend and i decided to get two entrees and split them: the chinese chicken salad (with tofu instead of chicken), and the mexican cilantro wrap. 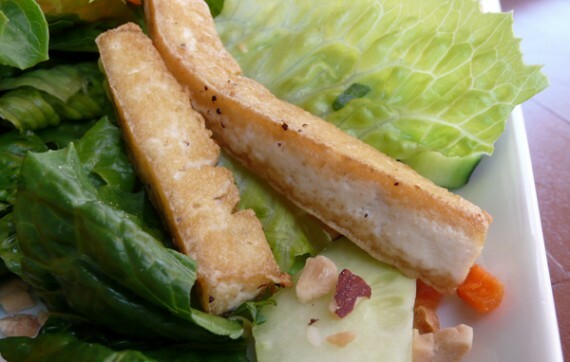 while i was a little skeptical of having tofu rather than chicken in the salad, it turned out to be wonderful. this was indeed some of the best marinated tofu i’ve ever had. it was slightly crisp and oily on the outside, then soft and juicy in the center. seriously tasty stuff. the rest of the salad was on point as well, all extremely fresh with an excellent vegan dressing. the mexican cilantro wrap did not disappoint, either. it was filled with the same amazing tofu plus vegetables, salsa and vegan cheese. since a jennshaggy designed the menu and told fratelli which brands to buy, you can trust that things like the fake cheese and meat are truly vegan. for a cheese substitute they use follow your heart, which isn’t my favorite, but it tasted pretty good in this wrap. 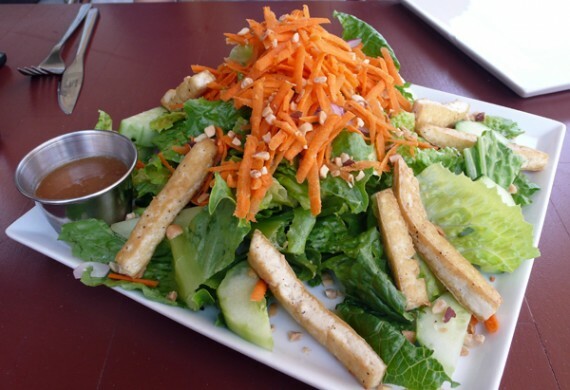 my friend ordered the mediterranean salad with chicken, and we were pleased to find it topped with huge thick slices of well-seasoned gardein. 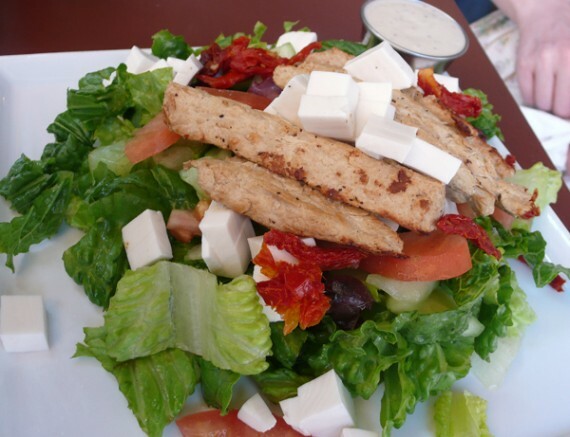 the only complaint i’d have about this salad, is it seemed to come with normal lettuce, not spinach like the menu indicated…and the follow your heart cheese was cut in cubes, not shredded. it impressed my omnivorous friend though, and she happily ate all of it. i ordered the pesto chicken sandwich was also stacked with gardein chicken and a garlicky vegan pesto sauce. this is my favorite thing so far i’ve ordered from fratelli. gardein is just so moist and flavorful, with stuff like this out there, i don’t understand why anyone eats meat. the pesto was also incredible, creamy and so full of flavor, the dairy was not missed one bit. so next time you find yourself on melrose, head over to fratelli cafe and check out their new vegan menu that our local jennshaggy designed. just grab the laminated menu and flip all the way to the back for the vegan selections. yum.